In only one week, the corpses of four humpback whales have been found along Canada's west coast, fueling questions of whether their deaths are connected to a recent uptick of whale and other marine animal deaths in Alaskan waters. So far scientists don't know what's causing the deaths, but some believe they could be connected to warmer than average ocean temperatures that have caused unusual and potentially poisonous algae blooms. The carcasses of 23 large whales, including endangered humpback and fin whales, were found in the western Gulf of Alaska last month, according to researchers at the University of Alaska Fairbanks. Of those, 18 are believed to be linked to a single event, although there is no direct cause known at this time. The deaths are believed to have occurred in late May or early June, based on the decomposition of the mammals. An unusual number of walrus and seabird carcasses have also been found near the dead fin whales, the Washington Post reported, though it's unclear whether the deaths are connected. One of the humpbacks found along the northern British Columbia coast reportedly had deep gashes on its tail, leading the people who found it to question whether it died from being entangled, although it has also been suggested that the injuries may have been older and unrelated. A First Nations group found it floating offshore, and towed it to land so it could be examined. It will be a couple weeks before the necropsies of that humpback and another also found in BC waters are done. No cause of death has been determined for either at this time. The other two dead whales have been spotted floating off the west coast of Vancouver Island. 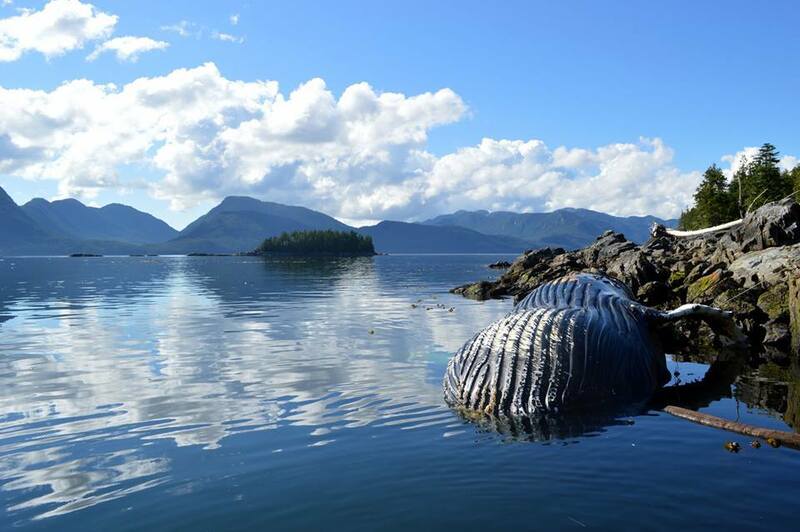 Dead humpback found this week, off northern BC coast, near Klemtu. Photo by Philip Charles. Researchers are analyzing the bodies of whales found in Alaskan waters, too, and some don't think they'll ever know for sure what happened. It's normal for scientists to see one dead fin whale every two years, the Washington Post states, meaning this year's fin whale die off is a big deal. "The cause is still a mystery," Briana Witteveen, research assistant professor at the University of Alaska Fairbanks, told VICE News in an email. As one marine ecosystem researcher tells VICE News, the whales found bobbing in the water or washed up on the shores could potentially have been killed by an algae bloom connected to warmer than normal ocean temperatures. "We have very unusual things happening," explained Tom Okey, a University of Victoria expert who researches the effects of climate change on marine ecosystems in the Pacific. "We have this big algae bloom, and some of those algae are toxic, and especially when the whole system is out of whack like that, you can have the toxic ones become very abundant. And so it is feasible, it is reasonable that there could be a link." Kate Wynne, a marine mammal specialist for the University of Alaska Sea Grant Program, told The Weather Channel that environmental toxins were her "leading hypothesis", too. Ocean surface temperatures in the North Pacific are well above average, with sea surface temperatures as high as 5.4 degrees Fahrenheit, or 3 degrees Celsius, warmer than normal. And the Gulf of Alaska is currently home to a warmer-than-usual water zone known as the "warm blob." Higher than normal sea surface temperatures can lead to toxic algae blooms. The larger than usual algae bloom that has been identified in the Pacific could be poisoning other animals, including sea lions. Baleen whales, meanwhile, feed low on the food chain, Okey said. They eat phytoplankton, also known as microalgae, which can become toxic to the organisms that eat them. And the whale deaths could signal something even worse beneath the ocean's surface. "Carcasses of whales are easy to see and easy to find," Okey said, "but other species that may have succumbed to toxins or some other disturbance either sink or are more difficult to see, so there might be massive, potentially massive, ecological changes that are happening in the Northeast Pacific." Okey did not hesitate to draw a possible connection between the variable ocean temperature changes and long-term climate change. "This could be a glimpse into the kinds of changes and the things that could happen with climate change," he told VICE News. "We know that there is a longer term trend of climate change, and these events here are very short term variability. It's climate variability and oceanographic variability. We also know that there are longer term trends with climate change, which will emerge out of the noise as we move forward in time. But some of these massive changes that are happening give us insight into what the future might look like for the Gulf of Alaska and the whole Northeast Pacific." Gashes on dead humpback's tail. Photo by Philip Charles. Once severely endangered, the humpback whale population has recovered somewhat since their hunting was banned in the 1960s, leading some groups to question whether they should be removed from the endangered species list, where they first appeared in 1970. In April, the NOAA suggested classifying humpbacks differently and breaking them into 14 groups based on where they reside. Following petitions arguing the humpback populations in Alaska and Hawaii have recovered, the NOAA proposed removing 10 of the 14 groups from the endangered species list, Scientific American reported. The Canadian government removed the humpback from the threatened species list last year because of its significant population increase. In the mid-1960s there were about 1,500 humpbacks in the North Pacific, but the latest estimates put the current population between 18,000 and 20,000. Fin whales are the second largest mammal on earth, smaller only than the blue whale. According to the NOAA, there are no reliable population estimates of fin whales. Commercial hunting of fin whales ended by 1987, except off the coast of Greenland, the NOAA said. In April, about 20 dead sei whales washed onto the beach of a remote part of southern Chile. A fin whale lies dead on Kodiak Island, in Alaska, in a June photo by Bree Witteveen, University of Alaska Fairbanks.